RHC Nightstand Event | What's On My Nightstand? This Fall during orientation many faculty, staff, and administrators met to discuss what they are reading or have recently read at our “What’s On Your Nightstand or Kindle” event. Here are the books discussed at the RHC event. I’ve split the books into two categories: fiction & nonfiction. “A potential breakthrough discovery to reverse global warming . . . a series of unexplained sudden deaths in British Columbia . . . a rash of international incidents between the United States and one of its closest allies that threatens to erupt into an actual shooting war . . .
NUMA director Dirk Pitt and his children, Dirk. Jr. and Summer, have reason to believe there’s a connection here somewhere, but they also know they have very little time to find it before events escalate out of control. Their only real clue might just be a mysterious silvery mineral traced to a long-ago expedition in search of the fabled Northwest Passage. But no one survived from that doomed mission, captain and crew perished to a man—and if Pitt and his colleague Al Giordino aren’t careful, the very same fate may await them” (Enriched Content Provided by Syndetics). Also recommended are the rest of the books in the Dirk Pitt series. “A horse of nineteenth century England tells his life story from his early home through many masters and experiences, both good and bad” (Enriched Content Provided by Syndetics). “Marion and Shiva Stone are twin brothers born of a secret union between a beautiful Indian nun and a brash British surgeon. Orphaned by their mother’s death and their father’s disappearance, bound together by a preternatural connection and a shared fascination with medicine, the twins come of age as Ethiopia hovers on the brink of revolution. Moving from Addis Ababa to New York City and back again,Cutting for Stone is an unforgettable story of love and betrayal, medicine and ordinary miracles-and two brothers whose fates are forever intertwined” (Enriched Content Provided by Syndetics). “For Davita Chandal, growing up in the New York of the 1930s and ’40s is an experience of joy and sadness. Her loving parents, both fervent radicals, fill her with the fiercely bright hope of a new and better world. But as the deprivations of war and depression take a ruthless toll, Davita unexpectedly turns to the Jewish faith that her mother had long ago abandoned, finding there both a solace for her questioning inner pain and a test of her budding spirit of independence” (Enriched Content Provided by Syndetics). This books is part of the American Sisters series geared towards Grades 4-6. The book is about a young girl named Dora whose parents get jobs working at the Chicago World’s Fair. Dora is charged with taking care of her sisters as they visit the fair while her parents work. “A spellbinding amalgam of murder mystery, family saga, love story, and financial intrigue. It’s a contagiously exciting, stunningly intelligent novel about society at its most hidden, and about the intimate lives of a brilliantly realized cast of characters, all of them forced to face the darker aspects of their world and of their own lives” (Enriched Content Provided by Syndetics). “This debut novel tells the story of Rachel, the daughter of a Danish mother and a black G.I. who becomes the sole survivor of a family tragedy. With her strict African American grandmother as her new guardian, Rachel moves to a mostly black community, where her light brown skin, blue eyes, and beauty bring mixed attention her way. Growing up in the 1980s, she learns to swallow her overwhelming grief and confronts her identity as a biracial young woman in a world that wants to see her as either black or white. In the tradition of Jamaica Kincaid’s Annie John and Toni Morrison’s The Bluest Eye, here is a portrait of a young girl—and society’s ideas of race, class, and beauty. It is a winner of the Bellwether Prize for best fiction manuscript addressing issues of social justice” (Enriched Content Provided by Syndetics). “Jackson, Mississippi, 1962. Black maids raise white children, but aren’t trusted not to steal the silver. Some lines will never be crossed. Aibileen is a black maid: smart, regal, and raising her seventeenth white child. Yet something shifted inside Aibileen the day her own son died while his bosses looked the other way. Minny, Aibileen’s best friend, is by some way the sassiest woman in Mississippi. But even her extraordinary cooking won’t protect Minny from the consequences of her tongue. Twenty-two-year-old Skeeter returns home with a degree and a head full of hope, but her mother will not be happy until there’s a ring on her finger. Seeking solace with Constantine, the beloved maid who raised her, Skeeter finds she has gone. But why will no one tell her where? Seemingly as different as can be, Skeeter, Aibileen and Minny’s lives converge over a clandestine project that will not only put them all at risk but also change the town of Jackson for ever. But why? And for what? The Help is a deeply moving, timeless and universal story about the lines we abide by, and the ones we won’t. Itis about how women, whether mothers or daughters, the help or the boss, relate to each other – and that terrible feeling that those who look after your children may understand them, even love them, better than you” (Enriched Content Provided by Syndetics). This is a novel set in India about five women aboard a women’s sleeping car called the Ladies Coupé on a train heading to Kanyakumari. Akhila is a fourty-five year old single woman who talks to the other women in the car about life, familial expectations, and whether a women needs a man and family in her life in order to be happy. The book explores through these women’s stories life for women in modern India. “Inspired by a true story, People of the Book is a novel of sweeping historical grandeur and intimate emotional intensity by an acclaimed and beloved author. Called “a tour de force” by the San Francisco Chronicle, this ambitious, electrifying work traces the harrowing journey of the famed Sarajevo Haggadah, a beautifully illuminated Hebrew manuscript created in fifteenth-century Spain. When it falls to Hanna Heath, an Australian rare-book expert, to conserve this priceless work, the series of tiny artifacts she discovers in its ancient binding—an insect wing fragment, wine stains, salt crystals, a white hair—only begin to unlock its deep mysteries and unexpectedly plunges Hanna into the intrigues of fine art forgers and ultra-nationalist fanatics” (Enriched Content Provided by Syndetics). “The United States and its allies invaded Iraq seven years ago. Today the country is still at war, and no one can claim that true democracy has come. Four million Iraqis have been displaced, and about half of them, unable to flee the country, are now living in remote tent camps without access to schools, health care, or often even food and clean water. InChildren of War, a companion title to Off to War: Voices of Soldiers’ Children, Deborah Ellis turns her attention to the most tragic victims of the Iraq war—Iraqi children. She interviews two dozen young people, mostly refugees living in Jordan, but also a few who are trying to build new lives in North America. Their frank and harrowing stories reveal inspiring resilience as the children try to survive the consequences of a war in which they play no part” (Enriched Content Provided by Syndetics). “Steve Bogira’s riveting book takes us into the heart of America’s criminal justice system. Courtroom 302 is the story of one year in one courtroom in Chicago’s Cook County Criminal Courthouse, the busiest felony courthouse in the country. We see the system through the eyes of the men and women who experience it, not only in the courtroom but in the lockup, the jury room, the judge’s chambers, the spectators’ gallery. When the judge and his staff go to the scene of the crime during a burglary trial, we go with them on the sheriff’s bus. We witness from behind the scenes the highest-profile case of the year: three young white men, one of them the son of a reputed mobster, charged with the racially motivated beating of a thirteen-year-old black boy. And we follow the cases that are the daily grind of the court, like that of the middle-aged man whose crack addiction brings him repeatedly back before the judge. Bogira shows us how the war on drugs is choking the system, and how in most instances justice is dispensed—as, under the circumstances, it must be—rapidly and mindlessly. The stories that unfold in the courtroom are often tragic, but they no longer seem so to the people who work there. Says a deputy in 302: “You hear this stuff every day, and you’re like, ‘Let’s go, let’s go, let’s get this over with and move on to the next thing.’” Steve Bogira is, as Robert Caro says, “a masterful reporter.” His special gift is his understanding of people—and his ability to make us see and understand them. Fast-paced, gripping, and bursting with character and incident, Courtroom 302 is a unique illumination of our criminal court system that raises fundamental issues of race, civil rights, and justice” (Enriched Content Provided by Syndetics). “Descendants of the original twenty-three Jewish families who arrived in New York in 1654, the Sephardic Jews began a tradition of wealth, pride, and exclusiveness that continues to this day. Stephen Birmingham sheds light on this segment of Jewish society who viewed other Jews as peasants, and ardently shunned all publicity. 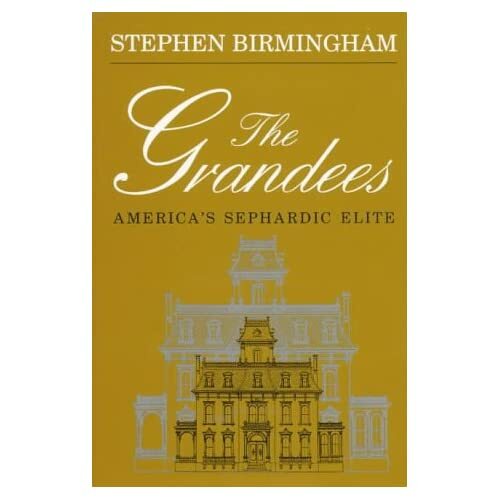 It is the story of over three centuries of power and achievement, scandal, and folly, elegant lifestyles, and sometimes flamboyant personalities—a story only Stephen Birmingham could tell with characteristic spellbinding skill” (back cover). “Her name was Henrietta Lacks, but scientists know her as HeLa. She was a poor Southern tobacco farmer who worked the same land as her slave ancestors, yet her cells—taken without her knowledge—became one of the most important tools in medicine. The first “immortal” human cells grown in culture, they are still alive today, though she has been dead for more than sixty years. If you could pile all HeLa cells ever grown onto a scale, they would weigh more than 50 million metric tons—as much as a hundred Empire State Buildings. HeLa cells were vital for developing the polio vaccine; uncovered secrets of cancer, viruses, and the atom bomb’s effects; helped lead to important advances like in vitro fertilization, cloning, and gene mapping; and have been bought and sold by the billions. Yet Henrietta Lacks remains virtually unknown, buried in an unmarked grave. Now Rebecca Skloot takes us on an extraordinary journey, from the “colored” ward of Johns Hopkins Hospital in the 1950s to stark white laboratories with freezers full of HeLa cells; from Henrietta’s small, dying hometown of Clover, Virginia—a land of wooden slave quarters, faith healings, and voodoo—to East Baltimore today, where her children and grandchildren live and struggle with the legacy of her cells. Over the decade it took to uncover this story, Rebecca became enmeshed in the lives of the Lacks family—especially Henrietta’s daughter Deborah, who was devastated to learn about her mother’s cells. She was consumed with questions: Had scientists cloned her mother? Did it hurt her when researchers infected her cells with viruses and shot them into space? What happened to her sister, Elsie, who died in a mental institution at the age of fifteen? And if her mother was so important to medicine, why couldn’t her children afford health insurance? Intimate in feeling, astonishing in scope, and impossible to put down, The Immortal Life of Henrietta Lacks captures the beauty and drama of scientific discovery, as well as its human consequences” (Enriched Content Provided by Syndetics). A brilliant, controversial and insightful biography from the author of the universally acclaimed The Victorians. A.N. Wilson’s tutor at Oxford was John Bayley, and it was there that Wilson met Irish Murdoch. He remained a close friend of them both, and it was at Iris’s pleading in 1988 that he agreed to write her biography. The biography was bound to be controversial, and Wilson pulls no punches in his attack on Bayley’s own book on Iris and the portrayal of her as an Alzheimer’s victim. Instead, he gives us back the fiercely intelligent novelist and philosopher, and shows us a relationship that was deeply loving yet profoundly eccentric, and very unconventional for its day. “With the Rolling Stones, Keith Richards created the riffs, the lyrics and the songs that roused the world, and over four decades he lived the original rock and roll life: taking the chances he wanted, speaking his mind, and making it all work in a way that no one before him had ever done. Now, at last, the man himself tells us the story of life in the crossfire hurricane. And what a life. Listening obsessively to Chuck Berry and Muddy Waters records as a child in post-war Kent. Learning guitar and forming a band with Mick Jagger and Brian Jones. The Rolling Stones’ first fame and success as a bad-boy band. The notorious Redlands drug bust and subsequent series of confrontations with a nervous establishment that led to his enduring image as outlaw and folk hero. Creating immortal riffs such as the ones in ‘Jumping Jack Flash’ and ‘Street Fighting Man’ and ‘Honky Tonk Women’. Falling in love with Anita Pallenberg and the death of Brian Jones. Tax exile in France, wildfire tours of the US, ‘Exile on Main Street’ and ‘Some Girls’. Ever increasing fame, isolation and addiction. Falling in love with Patti Hansen. Estrangement from Mick Jagger and subsequent reconciliation. Solo albums and performances with his band the Xpensive Winos. Marriage, family and the road that goes on for ever. In a voice that is uniquely and intimately his own, with the disarming honesty that has always been his trademark, Keith Richard brings us the essential life story of our times” (Enriched Content Provided by Syndetics). “In 2006 Russell Brand exploded onto the international comedy scene. He has been named Time Out’s Comedian of the Year, Best Newcomer at the British Comedy Awards, and Most Stylish Man by GQ’s Men. His UK stand-up tour was sold out and his BBC Radio 6 show became a cult phenomenon, the second most popular podcast of the year. Before the fame, however, Russell’s life was anything but glamorous. His father left when he was three months old, he was bulimic at age 12, and began drinking heavily and taking drugs by age 16. He regularly visited prostitutes in Soho, began cutting himself, took drugs on stage during his stand-up shows, and even set himself on fire while on crack cocaine. In 2003 Russell was told that he would be in prison, a mental hospital, or dead within six months unless he went into rehab. He has now been clean for three years, and hasn’t looked back since. This is Russell’s amazing story” (Enriched Content Provided by Syndetics). Also recommends Booky Wook 2: This Time It’s Personal by the same author. “Two kids with the same name lived in the same decaying city. One went on to be a Rhodes Scholar, decorated combat veteran, White House Fellow, and business leader. The other is serving a life sentence in prison. Here is the story of two boys and the journey of a generation. Wes just couldn’t shake off the unsettling coincidence, or the inkling that the two shared much more than space in the same newspaper. After following the story of the robbery, the manhunt, and the trial to its conclusion, he wrote a letter to the other Wes, now a convicted murderer serving a life sentence without the possibility of parole. His letter tentatively asked the questions that had been haunting him: Who are you? How did this happen? Told in alternating dramatic narratives that take readers from heart-wrenching losses to moments of surprising redemption,The Other Wes Moore tells the story of a generation of boys trying to find their way in a hostile world” (Enriched Content Provided by Syndetics). “The widely used herbal antidepressant kava is damaging to the liver. Pregnant women should avoid most herbal remedies because of pesticides and preservatives required in the growth and storage of the herbs. Most ayurvedic medicines contain unacceptable levels of lead and other heavy metals. St. John’s Wort could complicate any chronic medical condition. Many people see herbal remedies as “natural” and therefore safe, but in Prescription or Poison? Dr. Amitava Dasgupta explains that one of his first pharmacology professors taught him that “medicine” is just another word for “poison” and all medicines of any kind should be treated with great caution. This book, written for the layperson but based on solid science and research, explains how toxic many alternative remedies can be, alone or in combination with widely prescribed drug treatments. He includes detailed information on the proper use of alternative medicines and their history of good results, while also cautioning readers in this wake-up call about the casual, often uninformed, and sometimes damaging use of alternative remedies” (Enriched Content Provided by Syndetics). “This is the moving and powerful account of two remarkable boys struggling to survive in Chicago’s Henry Horner Homes, a public housing complex disfigured by crime and neglect. [It] presents the tender underside of America’s inner cities, the children, and reveals a side of our society that people often refuse to see” (Enriched Content Provided by Syndetics).